An alliance of civic groups is planning massive campaigns in protest of three main opposition lawmakers’ disparaging remarks about the May 18th, 1980 Gwangju Democratization Movement. The groups, including those based in Gwangju, held a joint press conference in the southwestern city on Monday, where they revealed plans to visit the Seoul headquarters of the Liberty Korea Party(LKP) on Wednesday to denounce the remarks. 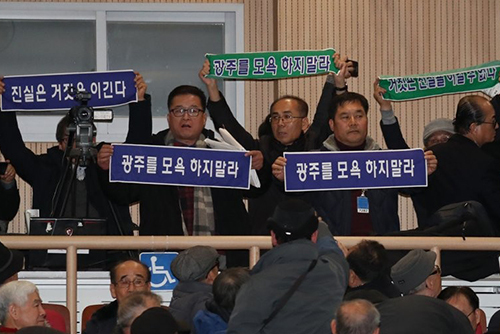 They said they will urge the conservative party to expel the three members, Representatives Kim Jin-tae, Lee Jong-myeong and Kim Soon-rye, and apologize for their remarks. In addition, the groups also seek to meet with the leaders of the ruling and opposition parties to call for legislation that would strengthen punishment for attempts at historical distortion. The civic groups will hold a petition campaign to drive the three lawmakers out of politics.